This article has been written in a personal capacity and the views expressed do not reflect the official positions of any organisation. The flight to Guwahati on 17th December, 2007, was late. As usual. I woke up late the next morning. As usual. Breakfast consisted of cheese sandwich and coffee. As usual. My friends came late to meet me. As usual. And then we set off to Umananda, an island situated in the Brahmaputra river just off the coast of Guwahati. The ferry ride took only five minutes and we embarked on the island that has a renowned Shiva Temple. 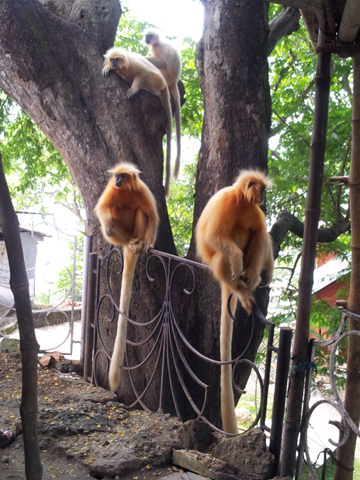 However, we went there to see the free living Golden Langurs that call Umananda their home. Many years ago, an animal trader namedto a priest on the island. The animals grew up as tame individuals and, after a period, reproduced. They were not caged but were free to roam the island. 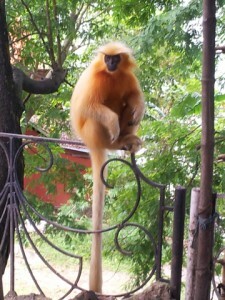 The Golden Langur being one of the rarest primates in the world (the animal was only discovered in the 1950s when it was christened with a scientific name) found principally in Manas National Park situated in Assam and Bhutan, the population on Umananda evoked significant interest amongst nature lovers. Possibly a unique case where wildlife trade has been benign, even beneficial, since the animals are so endangered and the translocated individuals on Umananda are a breeding group. And thus I was keen on observing and photographing them. We took the winding road on the island trying to catch a glimpse of these elusive creatures. Nothing was visible and I was slowly forming the impression that we would return empty handed without a sighting, let alone a film. But after a lot of searching, a friend pointed out a couple sleeping in a tree, huddled close to each other. It was difficult to film them among the foliage so we moved on. We had almost made the entire trip when we came across a group of four Golden Langurs perched in a tree, three adults and a baby. We were trying to photograph them when a mother descended from the tree with a young. She swung across from branch to branch, manoeuvring deftly with languid grace through the greenery. The mother was holding the baby but the tiny creature slid away. He glided down the tree and came close to me. I started clicking the camera. Watching him through the lens I saw that he had extended his hand. With trepidation I extended my hand, offering him a cake. And in a moment when time seemed to have frozen, the little baby lifted the cake from my outstretched palm. At that instant, she ceased to be an animal. She became a human child and I anthropomorphic. Anthropomorphism. A cardinal sin for a scientist, a momentary must for my spirit. Even when we left the island, I could still feel the gentle caress on my palm left by the baby Golden Langur. The Golden Langurs of Umananda yielded golden memories of a golden morning. Not the usual kind. Shubhobroto Ghosh is a former journalist for the Telegraph newspaper whose work has also been published in the Times of India, The New York Times, Statesman, Asian Age, and the Hindu. Ghosh has been active in animal protection issues since the early nineties and has been a member and supporter of several animal protection organizations, among them Durrell Wildlife Conservation Trust, Born Free Foundation, People For Animals, WWF and Beauty Without Cruelty. He has worked at the Wildlife Trust of India, was project coordinator for the Indian Zoo Inquiry sponsored by Zoocheck Canada, and did his Masters thesis on British zoos. Ghosh currently works as Senior Programmes Officer at TRAFFIC India in New Delhi. 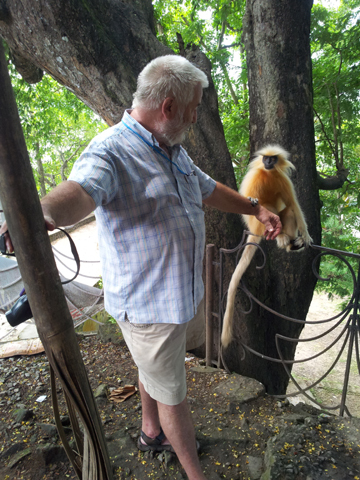 Editor’s take – On September 29, 2013, I visited Guwahati and the Golden Langurs (Trachypithecus geei, after E.P. Gee, who first noticed it) of Umananda. There are now five adults who are very tame and friendly. They would not eat any food except cake – à la Marie Antoinette! They would rush down the hill to meet every boat that arrived, for they wanted cake! This primate is incredibly beautiful – among the most beautiful animals I have seen – and human, sitting on a fence, posing for photos and even shaking hands with John Hick, the primate man. They had black faces surrounded by bright orange hair, not unlike the colour of the Bengal tiger. Later, I learned that the coat of the adult golden langur ranges from cream to golden in colour, with darker hair on its chest and flanks, and a very long tail measuring up to 50 cms. in length. It was heart-wrenching to tear ourselves away and return to Guwahati. 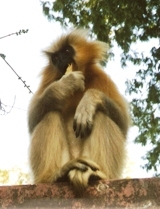 The Golden Langur is one of the most endangered primate species of India.